We’re kind of awash with ideas and plans here at EBXL headquarters. And it’s getting to be a problem. See… we want to provide all of these features, but in so doing we risk damaging the focus of the mod. Eventually every large mod has to choose whether or not to stick to their original plan or go the kitchen sink route and start implementing tangential features that stray further and further from the core. My strawberries are a good example of this dangerous border territory. Is it appropriate for a biome mod to provide decorative flowering plants? Of course. Is it appropriate for those plants to also be useful? Absolutely. But how useful? How many systems can they provide before those systems start to get in the way of what was previously largely aesthetic? It doesn’t make sense not to provide edible plants here and there… but it also doesn’t make sense to inundate the player with 30 new types of fruit and a system for mixing custom beverages out of them. Strawberries themselves are appropriate for inclusion in the mod, but certain features that I wanted to implement with them were not. But I AM going to write those features. And I’m going to write lettuce, onions, and tomatoes too… I’m just not putting them all in EBXL Core. When we release our 1.7.x build of the mod, we will be introducing the concept of official EBXL add-ons. These will be mods developed by the team that implement things that we want to see but also realize that some people may not – so we aren’t going to force them on you. The main mod will continue to provide all of the functionality that it traditionally has – but it will also serve as a launching point for any add-on mods that we release. In general, these add-on mods will be released separately from the main mod, and should maintain compatibility with a number of EBXL Core versions. Add-ons will also typically increase the complexity and difficulty level of the world in various ways. Right now, we have 2 submods that we’re talking about implementing – with numerous other ideas that haven’t quite yet been categorized. The first add-on we will release is (for lack of a better name) EBXL Farming. It will eventually grow to be a fully featured food mod with interesting crops and even more interesting ways to use them. Strawberries will remain in Core, and we will be joined by a handful of other edible wild plants. They will, however, not be farmable. So I will be nerfing Core’s wild strawberry plants and removing the seed recipe. Seeds and reliably renewable sources of custom food will go into the add-on. The add-on will also be adding a lot more edible plants that don’t fit in the main mod. Similarly, the chocolate recipe will remain in Core. It’s honestly something that Mojang should have implemented themselves in vanilla. But since they didn’t, we’ll provide the recipe ourselves out of all vanilla components. And we’ll continue to provide a recipe for chocolate covered strawberries. But those recipes will just use the vanilla 3×3 crafting grid. The add-on will introduce new cooking mechanics. This means new machines/tools/etc… that are outside of the scope of the main mod. If you install the add-on, it will optionally disable any vanilla-style cooking recipes that we add to Core in favor of more interesting ones. If it sounds like I’m being vague, well… maybe I am. The full scope of the farming mod is just a bit too big for this post. I’ll go into more detail when the time comes. But one other thing I will mention is that you won’t need to run electrical wires from a generator in order to can your strawberry jam. Our machines will remain relatively low tech – no plugs involved. The second add-on will be EBXL Fantasy (also for lack of a better name). This is were biomes that don’t exist in the real world will go. Like the old Forgotten Nature (Trees++) crystal forest. We’ve not forgotten about it, but crystal trees just don’t fit in a mod that tries to base everything on reality. I have no clue what else might eventually actually go into this add-on, but we’ve got a laundry list of features that may change the behaviors of existing biomes. Like wasteland. Something will probably happen to it in the fantasy add-on. Probably. If all goes well, the farming add-on will ship its first public build within hours (or days – but not weeks) of our public 1.7 release candidate. Fantasy is still way out there – we are still just in the planning phase there. Just a quick update to get this bug-fix out in the wild. There is a little under the hood prep work for making the transition between 1.6 and 1.7 that will cause MC to complain again about blocks being changed but it should not cause any issues. Sakura Log side texture is the correct size once more so that it no longer shows up as a missing texture. Fixed and NPE while generating Large Fir Trees. Updated some of the internal block references to make them compatible with the new 1.7 versions. Well the time has come to get a few more crashes out of the way. We had a major server crash that some how managed to slip through testing on our end, along with a client side crash with tukMC is also installed and you looked at one of our quarter, elbow or mini logs due to tukMC trying to render an a block with invalid metadata. We also started updating some of the block “names” that minecraft/forge stores in maps in preparation for upgrading to 1.7. This will cause MC to complain that blocks have changed but is just MC/forge letting you know that we updated stuff on our end so that once the fully get rid of external id’s you won’t have to type something like “extrabiomes.block.BlockCustomFlower:extrabiomes.block.BlockCustomFlower” and instead be able to do something more along the lines of “extrabiomesxl:flower1”, much easier on the keyboard ehh? Oh and we back-ported the new localization and smart tool tip code so that flowers and such can now have their tool tips localized. If anyone has any suggestions for flavor text for any of the flowers that don’t have descriptions feel free to chime on in, although Annysia would probably prefer that you do it over on the official forums thread where you gets notifications about such any posts. Fixed crash with tukMC and any other mod that creates fake items for render resulting in invalid metadata in the item form for Mini, Quarter and Elbow logs. Fix server crash from missed placed SideOnly in BlockCustomFlower. Tool tips for flowers are now localized, and will automatically wrap text so that it does not need to manually be formatted as such in the localization. Flower names localization has changed for easier translation in the future. No more extrabiomes.flower.0, as the localization string now says the flower name. This breaks most existing translation, but will be better in the long run. 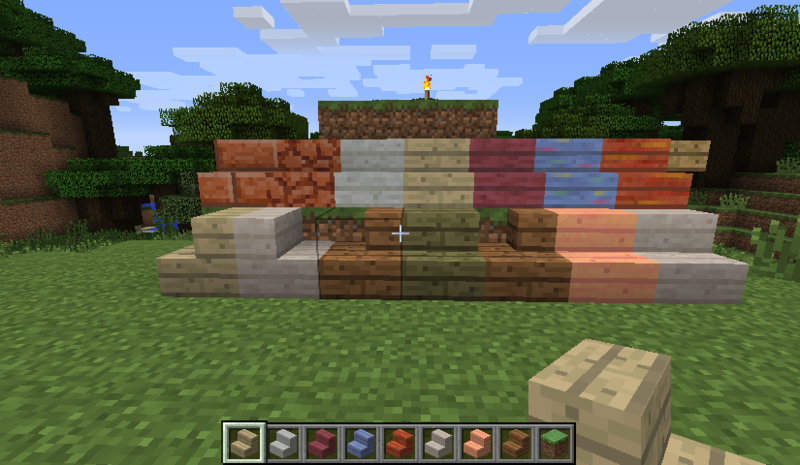 Some blocks had their internal “keys” changed in preparation for updating to 1.7, this will result in MC saying that some blocks have changed but it is not an issue as it will not break anything in 1.6. Not much new news about 1.7 at the moment as I personally have been catching up on sleep and dealing with my full time job, and other outside of modding stuff along with getting 3.15.6 out the door. That said I do have stairs completed so there is that, but they may end up getting a little more work as they way that vanilla handles stairs is a little restrictive for what I would like to do with the block config file, but that will have to wait for the moment.